Jaguar has won what’s been described as a landmark case against Chinese car-maker Landwind for producing a copycat version of its Range Rover Evoque. The court case held in China is set to have far-reaching consequences for other copycat Chinese car-makers, after a judge ruled that the Landwind X7 was a near replica of the current Evoque. Until now Landwind, which only sells the X7 in China, has hidden behind local laws that made it difficult for a non-Chinese company to sue for damages following a breach of copyright or trademark. According to the Beijing Chaoyang District Court, Landwind was found to have copied five unique features of the Range Rover Evoque that led to widespread customer confusion. Helping JLR win its case, the court found the X7 to have near identical tail-lights and a similar shape including that roof and window line that tapered from front to back, mimicking the side character lines of the small Range Rover. Describing its win against Landwind a “first in the global car industry”, Jaguar Land Rover took three years to triumph in its unfair competition case. 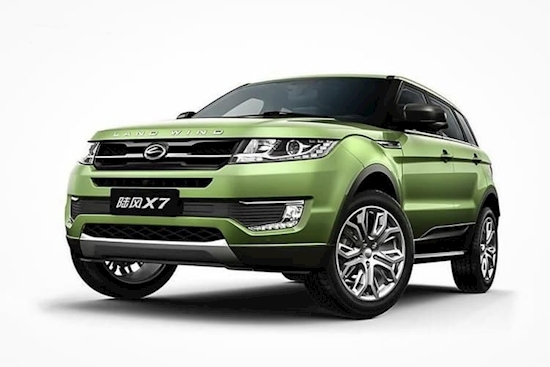 The Landwind X7 was originally launched back in 2014 but was recently facelifted it in an attempt to tone down the small SUV’s similarities to the Evoque. The court said Landwind could continue to sell the updated X7. Despite this, JLR declared the ruling as a clear sign China was taking copyright claims more seriously. “This ruling is a clear sign of the law being implemented appropriately to protect consumers and uphold their rights so that they are not confused or misled, while protecting business investment in design and innovation,” said Keith Benjamin, a senior lawyer acting for JLR. Originally, it was thought the Range Rover Evoque was fair game following a Chinese court judgment back in 2016 that cancelled JLR’s patent for the small SUV because it had been patented outside China. Selling from just $27,000 in China, the X7 has been a popular model for Landwind, not least because it costs a fraction of the $80,000 price tag that JLR charges for the Evoque. At its peak, Landwind was rumoured to be selling around 80,000 X7s annually. JLR’s victory in the courts comes at a time when the car-maker is struggling in China. Last year it only managed to shift 115,000 cars — a drop of 22 per cent on the previous year.